MEMOFIN - Technical advice on third country regulatory equivalence under EMIR – Hong Kong - L'information financière que vous ne trouvez nulle part ailleurs ! The European Commission mandated ESMA on 11 October 2012 to provide it with technical advice on the equivalence between the Hong Kong regulatory regime and three specific aspects of the EU regulatory regime under EMIR. On 27 February 2013, the Commission amended the original mandate to postpone the deadlines for the delivery of the technical advice by ESMA. As for Hong Kong the original deadline of 15 June 2013 was changed to 15 July 2013. On 13 June 2012, the European Commission further amended the mandate to postpone the deadlines for the delivery of technical advice by ESMA and to change its scope in respect of certain jurisdictions. For Hong Kong the revised deadline of 15 July 2013 was changed to 1 October 2013. The mandate on equivalence for Hong Kong covers three specific areas: 1) the recognition of third country CCPs; 2) the recognition of third country TRs; and 3) the identification of potentially duplicative or conflicting requirements regarding the clearing obligation, reporting obligation, non-financial counterparties and risk-mitigation techniques for OTC derivative contracts not cleared by a CCP. 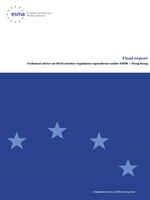 This report sets out ESMA’s advice to the European Commission in respect of the equivalence between the Hong Kong regulatory regime and the EU regulatory regime under EMIR in respect of the recognition of third country CCPs. Hong Kong is still in the process of finalising its regulatory regime for TRs and for the clearing obligation, reporting obligation, non-financial counterparties and risk mitigation techniques for uncleared trades. ESMA is therefore still in the process of preparing its technical advice under these limbs of the European Commission’s mandate. That technical advice will be delivered at a later date. ESMA has liaised with its counterparts in Hong Kong (HKMA and the SFC) in the preparation of this report and has exchanged materials and views on the key areas of the analysis. However, the views expressed in this report are those of ESMA and ESMA alone is responsible for the accuracy of this advice. ESMA has decided not to launch a public consultation on this advice. The advice is not about a policy option or a legislative measure that could be subject to improvement or reconsideration due to market participants’ views or comments. It is a factual comparison of the respective rules of two foreign jurisdictions with the EU regime and an advice on how to incorporate these differences in a possible equivalence decision. ESMA is aware of the effects that an equivalence decision by the Commission could have on market participants, but considers that the key element of this advice is of a factual nature, not a policy one.